You don’t really NEED the butter, but you know you want it . Sure the end of summer is super sad. But at least sweet, yummy, tender corn is in season. A couple of weeks ago we were awash in a sea of niblets. My son Elijah loves the stuff and can chomp through two ears at one sitting. So we usually keep some shucked and saran-wrapped grocery store corn in the fridge just in case. Then my husband’s brother Jimmy handed off another 12 ears of the farm fresh variety. So we had corn recipes on the brain and in our bellies and here’s one of them – Dorie Greenspan‘s Corniest Corn Muffins from her James Beard award-winning cookbook, Baking. She says you can make these with frozen or canned corn, but fresh is really best. These easy, hand-mixed creations have a straight from the farmer’s field wholesomeness that I don’t think would be possible with preserved corn. And it’s easy, rather messy, but so worth cutting the fresh kernels off the cob. What’s more, shucking the corn is a two-year-old’s dream. It’s simple for them to pull off the green jackets and Elijah always glows with a sense of accomplishment afterwards. To free the kernels from the cob, grab a sharp knife, stand the cob up on its base in a shallow-sided bowl and position your knife at the base of the niblets, just below your fingers, which are holding the cob gingerly at the top. Then run the knife straight down, turn the cob and do it all again. You’ll get the hang of it after the first couple of cuts. Once you’ve liberated the kernels I always run the back of my knife down the cob a few more times to squish out the sweet corn milk, which you can add to batter with the niblets. 1 cup corn kernels (Add up to 1/3 cup more if you like). Fresh or frozen or even canned; if canned niblets should be drained and patted dry. Center a rack in the oven and preheat to 400 degrees F. Butter, spray or line 12 muffin cups in a regular-sized muffin pan. 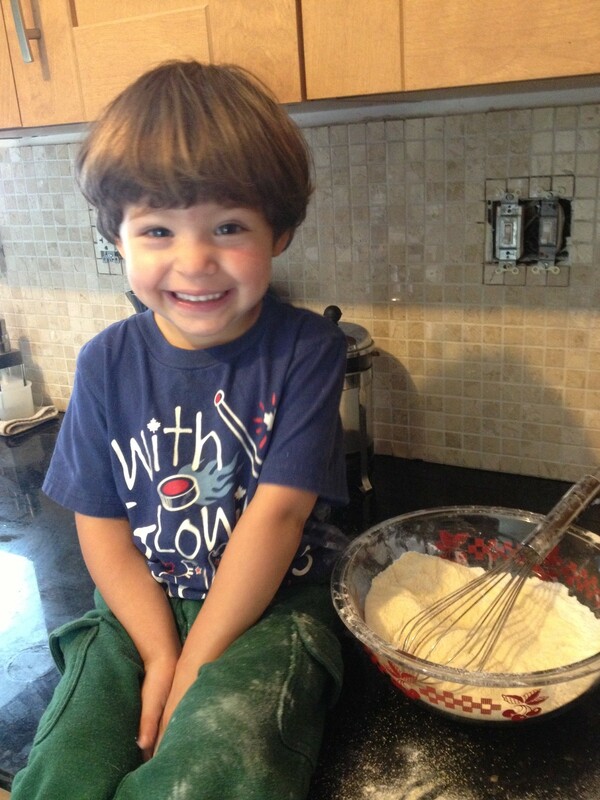 In a large bowl, whisk flour, cornmeal, sugar, baking powder, baking soda, and salt. He he I’m making muffins. In a large glass measuring cup or another bowl, whisk buttermilk, melted butter, oil, egg and yolk until well blended. Pour the liquid ingredients over the dry ingredients and with a whisk or rubber spatula gently but quickly stir to just combine. Don’t worry it’s supposed to be lumpy. Stir in corn niblets. Make sure not to over mix. Divide evenly among muffin cups. Bake for 15 to 18 minutes or until tops are golden and a thin knife or skewer inserted into center of muffin comes out clean. Transfer pan to a rack or a teatowel covered counter. Let cool 5 minutes before carefully removing muffins. Slather with butter or eat as is. Best served straight from the over or warm up leftovers in microwave for 20 seconds. These muffins can be frozen after they are baked. Wrap them tightly and freeze for up to 2 months. Rewarm in a 350 degree F oven. 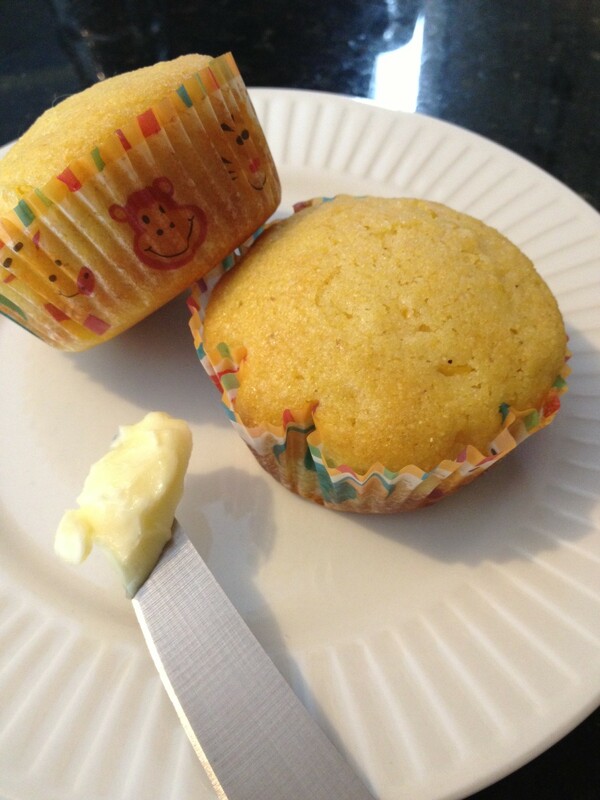 This entry was posted in Savoury, Sweet and tagged Baking, Butter, Corn kernels, Dorie Greenspan, Maize, Muffin. Bookmark the permalink. Happy 80th birthday Mum. Sophie and Elijah look hungry. The Rub is crying out for some meat. That much corinader. Really? Yes!